The weather has been pleasant the past two weeks and we had the opportunity to go in search of geocaches on three separate days. 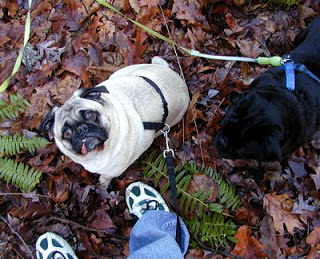 This blog entry will highlight Christmas Day, when we decided to take the innpugs on a geocaching adventure on the old stagecoach road that partially runs along Point Lookout Trail, a 3.5-mile greenway near the Inn. 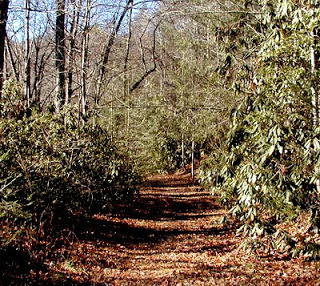 You can access the stagecoach road by starting at the bottom of Point Lookout Trail — near Piney Grove Baptist Church off Old Highway 70 in Old Fort — and heading along the trail a short distance until you get to a brown barricade on your left that marks the dirt stagecoach road, once used as a route between Old Fort and Asheville in the 1700s and 1800s before construction of the railroad through the area. 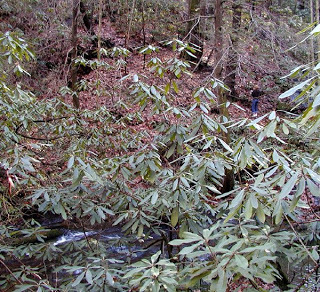 The stagecoach road is now used by hikers, mountain bikers, and horseback riders, as well as geocachers on the hunt for two caches, Cross Creek Climbing Cache and Spyder’s Cache. We’d walked along the old stagecoach road before in the fall, and not much had changed since our last visit, except for the lack of fall foliage. 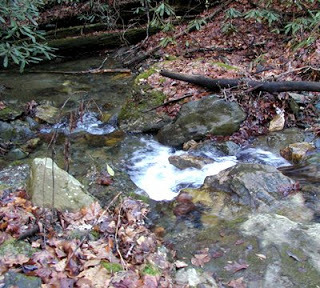 The cache search led us further than we had gone before, along Swannanoa Creek, which we enjoyed listening to as we hiked, and we hoped that the creek wasn’t too full that we couldn’t cross it when we arrived at the cache location. 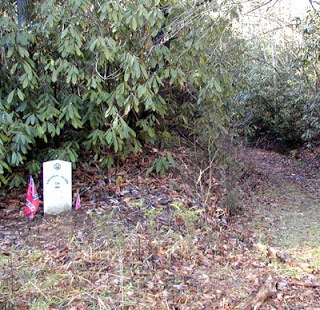 One of the unique things along the way was a grave marker for an unknown Confederate soldier, still respectfully maintained by someone. It was interesting to think about Civil War skirmishes taking place along the stagecoach route in the exact spot where we were walking. 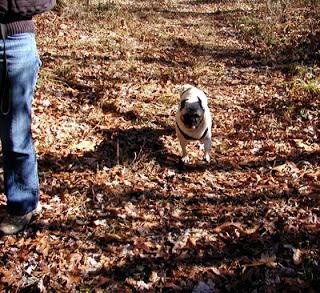 Once at a good location to cross the creek, Dave stayed with the innpugs while Brigette volunteered to climb up the hill where the cache was hidden. 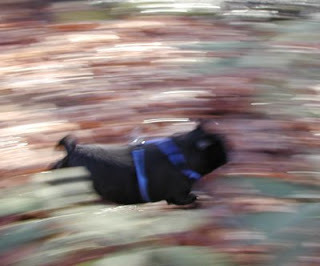 Crossing the creek was not as easy as we had hoped, but Brigette, clearly (crazily?) committed to the caching mission, rolled up her jeans and stepped across the rocks to the other side. See Brigette? Click photo to enlarge. Then came the climb, also not easy, but Brigette adopted Bugsy the innpug’s mountain goat mentality and skurried up the ridge to where the GPS receiver (“GPSr”) said the cache would be. After about ten minutes of studying the GPSr and pondering where the cache might be hidden, Brigette started thinking it would have been a better idea for Dave to come and look for the cache. This is because on all previous caching adventures, Brigette, relying mostly on the GPSr, does what is commonly referred to as the Drunken Bee Dance, eyes intensely focused on the GPSr while stumbling in circles yelling out “2 feet south! 1 foot northeast! 5 feet west!”. Dave, on the other hand, takes the approach of actually looking around and manages to locate the cache in what seems like just seconds. Brigette attempted the Dave Method, to no avail. After 20 minutes, the sun headed over the ridge and the innpugs became restless. It was time to call it a day without even considering a search for the other cache, Spyder’s Cache. It was very disappointing to have to log a “Did Not Find” on the Cross Creek Climbing Cache, but we were able to enjoy a peaceful spot near Swannanoa Creek with no other people around and to take a hike on a beautiful December day with no need for coats or hats. That made the trip well worth it. Chances are, we’ll be back to get those caches soon.